Hello friends! I'm back with Part 2 of my Girly Bits post. This one includes four shades that will be available at Polish Con in White Plains, NY this weekend, and one shade from the rebooted Concert Series. Make sure to read to the end of this post for more details about availability for each one! Very Important Polish (Polish Con NY 2018) is a blackened base with shifting shimmer and glass fleck in red, orange, gold, violet, and green, and holo prism flakes. This beauty will be available to all the lucky ducks who purchased VIP bags for the Polish Con this weekend. The formula was really nice and smooth and covered well. Shown is two coats plus top coat. Dreamlike (Polish Con NY 2018) is a denim blue holo with rose gold shimmer, turquoise shimmer, purple to green shifting metallic flakes, and red to gold shifting metallic flakes. There is so much going on with all the little elements, it's quite beautiful! This had a very smooth and thin formula that takes an extra coat to build up coverage. Shown is three coats plus top coat. holographic particles. Shown is two coats plus top coat. She's A Lady (Polish Con NY 2018) is a light turquoise crelly base, with aqua shimmer and reddish copper metallic flakes. Shown is two coats plus top coat. Pam started the Concert Series years ago to pay tribute her favorite bands and catalogue the concerts she attends. It's being revived now as a result of her discovery of the band Greta Van Fleet. Last Summer their song "Highway Tunes" really grabbed Pam's attention and she was blown away the first time she saw them in concert. Her main inspiration for this shade was the cover art from their double EP "From the Fires". Sparrow of the Dawn (Concert Series, inspired by Greta Van Fleet) is a deep navy base, with a strong green-copper-pink multi-chrome shift, and a heavy dose of tiny holo glitters. I have seen a ton of swatch photos of this polish and every time I do I am blown away! It is a true beauty and the formula is great. Shown is two coats plus top coat. What does that mean for our turn-around time for processing and shipping orders? 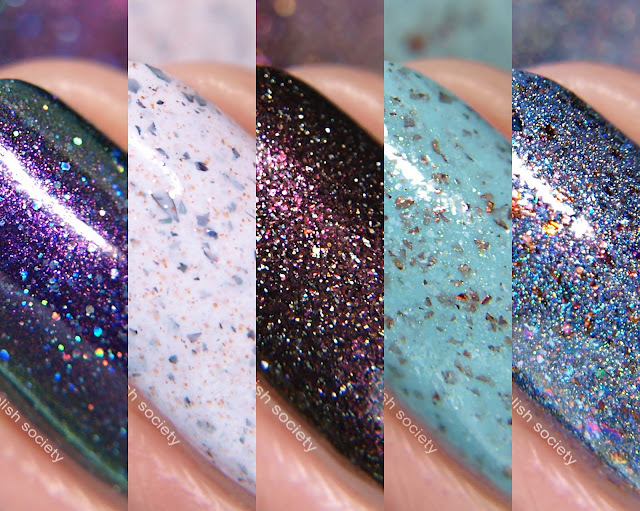 The other three limited edition Polish Con shades will be $13 USD at the event, and will retail for $16.50 online starting early July. Sparrow of the Dawn (concert series) is available online now and retails for $16.50 CAD.